WHITMAN — The Board of Selectmen approved an emergency notification policy and authorized Fire Chief Timothy Grenno to sign the Sachem Rock Regional Emergency Planning Zone By-laws at its Tuesday, July 21 meeting. Grenno explained that the new notification policy, which is used to alert townspeople about emergency and nonemergency events, makes it clear which town departments are authorized to notify the public about which events, and ensures the notification will be reviewed by at least two people before being sent out. These notifications might include where to park cars during extreme weather, alerts about accidents or reminders about town events. Whitman Emergency Officials partnered with CivicReady to create the new emergency preparedness and mass notification services for citizens, whitman-ma.gov/ready, which was launched at the start of the new fiscal year on July 1. Selectman Daniel Salvucci worried that residents may stop paying attention to notifications if they receive too many. “We need them to listen,” he said. Grenno agreed, saying the system is designed so that residents can choose which types of notifications they want to receive, so some can cut down on clutter if they only want to receive emergency notifications. He added that the messages are limited to one minute each, which should encourage people to take the time to listen to them. The CivicReady system allows public safety officials to communicate with citizens quickly and efficiently before, during and after an emergency. Citizens can sign up to receive alerts via email, SMS (Text Messaging), voice calls and all messages broadcasted will be available on the Town of Whitman social media sites. FEMA-sourced emergency preparedness content is easily accessible to citizens to keep our community informed in the event of an emergency. The Fire Chief and Police Chief’s monthly reports were postponed until the August Selectmen’s Meeting. HANSON — The Board of Selectmen Tuesday, July 21 appointed an interim town administrator and resident members of a search committee. Retired Rochester Town Administrator Richard LaCamera was the only interim candidate interviewed as Suzanne Kennedy, who had also been on the list, was no longer available. In accordance with regulations governing the part-time employment of retirees, LaCamera said he expects to work about two or three days a week and is “absolutely not” interested in applying for consideration as a full-time town administrator. LaCamera has 32 years of municipal experience in Lakeville, where he served as a selectman and member of the finance committee, and Rochester where he was town administrator for eight and a half years. Selectmen will have to negotiate and approve a contract with LaCamera. They questioned him on his knowledge of funding regional school projects and his opinion of selectmen public safety liaisons and their attending department head meetings. LaCamera said he is comfortable with the liaison concept as Rochester has a Public Safety Committee that meets once a month and is part of a regional school district. While he agreed with Town Administrator Ron San Angelo’s view that department heads might not be comfortable with selectmen sitting in on meetings, he had no firm objections. Joining Selectman Chairman Bruce Young and a member of the Planning Board on the search committee, selectmen voted to appoint small businessman Michael McLeod, retired Verizon executive Joseph Amaral Jr., retired educator Constance Constantine, former Board of Health member Richard Edgehille and Kenneth McCormick who is a Hanson resident and member of the Pembroke Fire Department. Young thanked all those who applied for the search committee. “It was especially good to see new people coming forward who have never been on a committee before,” he said. Not selected from the pool of 10 applicants were Community Preservation Commission Chairman Laura FitzGerald-Kemmett, South Shore Vo-Tech Superintendent-Director Dr. Thomas Hickey, Library Director Nancy Cappellini, former Selectman James Egan and Plymouth County Mosquito Control Commissioner Kimberley King. McLeod received a vote from all five selectmen and McCormick received four on a paper ballot circulated among selectmen. Receiving three votes each were Amaral, Constantine, Edgehille and Hickey. Selectmen voted publicly during the meeting to break the four-way tie. At the end of the first round, Edgehille and Hickey were still tied with three votes each. In the end, Edgehille received votes from McGahan, Kenny Mitchell and Bill Scott. Selectmen Don Howard and Young voted for Hickey. In other business, selectmen voted to place an article on $79,841.03 of the $179,841.03 cleanup of Hanson Middle School following a sewage backup in April caused by improperly disposed sanitary napkins. The W-H insurance carrier pays out a maximum of $100,000 for sewer backups. The school district had the damage repaired and cleaned twice, but later swab tests required by the Category 3 sewerage backup revealed bacterial contamination in “areas the we ordinarily wouldn’t get into” under cabinets, for example, according to Facilities Director Ernest Sandland. Once walls were opened during repair work this summer, more damage and contamination was found. Selectmen’s approval was required to get the work done before school opens. Both Sandland and School District Business Manager Christine Suckow said Principal William Tranter had immediately contacted the school nurse after the incident about conducting preventive talks with students on how to properly dispose of feminine hygiene products. “He followed it up appropriately,” Sandland said. Selectmen also voted to place a $12,100 article on the October warrant for Hanson’s share of a failing hot water heater that serves the lavatories at Whitman-Hanson Regional High School. How Do You Keep Cool in Summer? but what we don’t know is how you, our readers, beat the heat! Share some of your summer fun! Simply download the activity forms below, fill them out and return it to us. Your response might be featured in our newspaper and online! Submissions from all ages & all adjacent towns accepted! Three Activities to Choose From! ACTIVITY 1: Coloring Page Theme: What do you do to keep cool? ACTIVITY 3: Pet Photos! 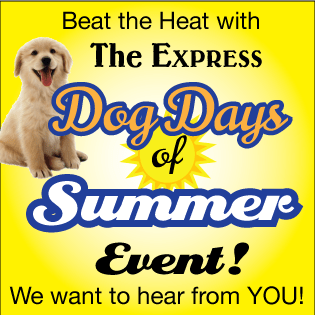 Theme: How do your pet keep cool? Send in a summer picture of your pet! D eadline is Aug. 10th! All entries will appear either online or in our newspapers August 13th and 14th! Only a limited number of submissions will appear in print (due to space limitations), but all entries will appear on our websites. The Express Newspapers reserves the right not to publish any submissions it deems inappropriate. Limit of four entries per household. All submissions become the property of the Express Newspapers and WILL NOT BE RETURNED. IF YOU WANT TO KEEP THE ORIGINAL FOR YOUR PERSONAL USE, PLEASE SEND US A COPY! Deer population, harsh winter causing surge of suckers? Some health officials across Massachusetts are bracing for a particularly bad season for tick-borne disease this summer due to increasing deer populations and the effects of recent severe winter weather. There are more than 95,000 deer statewide, according to the Mass. Department of Energy and Environmental Affairs. Densities range from about 10-15 deer per square mile in northwestern Massachusetts to more than 80 deer per square mile in areas of eastern Massachusetts closed to hunting. Last winter added to the problem. “The deep snow likely served as an insulator, much to everyone’s chagrin,” Thomas N. Mather, director of the University of Rhode Island’s Center for Vector-Borne Disease and its TickEncounter Resource Center (tickencounter.org) said in published reports last month. Other experts see a supposition being voiced base on the biology of the tick, but urge people to take precautions just the same. Mosquitoes often get the most attention this time of year because of the higher incidences of arboviruses such as West Nile and Eastern Equine Encephalitis (EEE) carried by the vectors. As of Wednesday, however, there have been no positive test samples for either EEE or West Nile across the state. But with recent heavy rainfall, Brown cautioned, we are not out of the woods yet, where mosquitoes are concerned. Mosquitoes are also more easily managed than ticks, but tick-borne diseases are equally damaging to human health. Deer ticks, which carry Lyme disease — as well as Rocky Mountain Spotted Fever, Babesiosis, and Human Granulocytic Anaplasmosis (HGA) — are prevalent during this time of year. The highest incidence of Lyme is seen in June, July, and August with the most affected age groups are youngsters ages 5 to 9, and older adults between 65 and 75. Data from the Mass. DPH and the Centers from Disease Control and Prevention, shows Bristol and Plymouth Counties, along with Cape Cod and the Islands have the highest incidence rates in the State. At dawn and dusk, ticks of all varieties sit on the end of branches or blades of grass and extend their front legs to latch onto hosts, medical entymologist Wayne Andrews told those attending a public information forum on tick and mosquito-borne diseases held at Hanson Middle School in 2013. June is the highest-risk time as both nymph and adult ticks are questing for a host at that period in their two-year life cycle. Ticks thrive in brush, wooded, or grassy places and they are after blood, on which they feast after biting an animal or human — that, too, is how they spread disease. Knowing the wildlife attractive to ticks, and how to keep them out of your yard can also help. “Ticks are brought to your yard by deer and become infected mainly by feeding on mice,” according to tickencounter.org. “Keep deer out by planting undesirable plants, installing deer fencing or applying deer repellents. Cathleen Drinan, health agent for both Plympton and Halifax, emphasizes personal protection and education to combat tick-borne diseases. In our region, 58 cases of Lyme disease and two of HGA were discovered in Halifax alone last year. The culprits aren’t always deer ticks, either, according to Drinan; dog ticks and wood ticks can also cause disease. The Commonwealth, after a special report was commissioned in 2013 by the General Court, is taking both short and long-term approaches to this public health menace, hoping to return tick-bite rates back to those of 30-50 years ago in the next 25 years. Vaccination, environmental modes of intervention, deer management, and education on personal protection, are some of the goals set forward in the report. Ticks usually need to be attached to their host for 24-hours for Lyme disease to develop. Symptoms in humans typically include a round rash for up to a month after the bite, characterized by a clear area in the center, yet this rash does not always develop. Vague flu-like symptoms are also present in the early stages of the disease. Even if symptoms lessen without treatment, the disease may not have cleared completely, so early treatment with antibiotics is necessary to prevent more serious problems from developing months or even years later. These include serious joint, nervous system, and heart problems that can be permanent. Meningitis, an often deadly swelling of the membrane covering the brain, can even develop. Patients with a “classic” donut-shaped rash are easy to diagnose, but otherwise most of the infected will need a blood test to confirm the Lyme Disease diagnosis. The best ways to protect yourself from tick bites are to avoid areas where ticks live. If this is not possible, wearing long sleeves and tucking pants into socks are essential. Spraying shoes and legs with insect repellents (make sure they are effective against ticks by reading labels carefully), checking for ticks frequently, and removing ticks quickly with tweezers without squeezing or twisting are all good prevention measures, according to the DPH. “It is very important for people to educate themselves on the seriousness of this and to use all the personal protection measures they can,” according to Drinan. For more information, visit mass.gov/eohhs. Contact a doctor or nurse if you think you are ill sooner rather than later. All local boards of health have information on ticks, tick-borne diseases, and disease prevention methods. WHITMAN — Town officials are looking for new applicants for interest-deferred housing rehab loans under a joint grant program with the town of Abington. The Abington-Whitman Housing Rehabilitation Program assists low- and moderate-income homeowners in specified areas within the two towns with making home repairs they could not otherwise afford. The grant, now in its second round of funding, was approved by the Department of Housing and Community Development. The towns have 18 months in which to spend this round of funding, according to Enos, so the towns may apply again. Whitman has done 18 such projects so far which have included replacement of roofs, windows, walls, heating systems and other emergency repairs. “We teamed up with Abington because the grants are competitive and the greater need you can demonstrate, the greater likelihood you will be considered favorably for the grant,” Town Administrator Frank Lynam said. The Abington-Whitman Housing Rehabilitation Program has committed the towns to “10 and 10,” or 20 improvements in the two towns over the course of each grant cycle. The first round of grants was received in 2012, round two in 2014, and a third round is being sought in 2016, according to Lynam. Financial assistance is provided as a 0 percent interest, deferred payment loan meaning that no interest is ever charged and no payments are required as long as the owners continue to own and occupy their property, according to project consultant Paula Start with Community Opportunities Group Inc., in Boston. “At the end of the 15-year term of the deferred payment loan (DPL) the loan is forgiven and essentially becomes a grant,” she said. Lynam noted that, should a homeowner fall short of the 15-year occupancy requirement, the entire loan has to be repaid as part of the property settlement. The streets included in the target area represent Whitman’s older housing stock, Lynam said. “The people that have been living there either have been living there a long time or are not necessarily long-term residents but they don’t have the income and ability to do the necessary improvements to make the houses habitable,” he said. Up to $35,000 per unit can be provided to cover eligible repairs. Low-income (less than 50 percent of area median income) homeowners can receive 100 percent of project costs. Moderate-income owners (51 to 80 percent of area median income) can receive 75 percent of project costs from the program and would provide 25 percent from personal funds or a bank loan. Once the homeowner approves the specifications, the specs go out to bid to contractors who register with the program. Community Opportunities Group checks references and make sure they are licensed and insured, according to Stuart. The Rehab Specialist inspects all completed work to be sure it’s done properly and according to the specs. The contractors are required to issue a one-year warranty on all labor as well as any manufacturer’s warranties on materials. “While we focus in the target areas we can do projects involving needed emergency repairs anywhere within the two towns —leaking roof, failed septic system, accessibility modifications, failed heating systems, etc.,” she said. Lynam said the program is another example of how regional collaborations can help individual towns. “We’ve been pretty successful in teaming up,” he said. In addition to the housing rehab program, Whitman has entered into a partnership with Abington to provide veterans’ services. Whitman and Abington most recently entered into a one-year trial inter-municipal agreement with Hanson for small animal control. Regionalized veterans’ services, while it’s not saving money in the short term, is providing more services to veterans in both Whitman and Abington, Lynam said. Chapter 115 is the statute requiring towns to provide minimal benefits for their veterans in need. HANSON — In the first initiative sponsored by the nonprofit group, On Solid Ground, founder Lynda Cripps is hosting informational sessions about addiction at the Hanson Public Library between 11 a.m. and 12:30 p.m. every other Saturday this summer, starting July 18. The final session is slated for Aug. 29. Cripps is a registered nurse certified in addiction who has spoken at conferences and conducts informational sessions for businesses. She hopes this program will offer the community an educational resource for those who can’t find reliable resources online, or would prefer to speak to an expert in person rather than read from a website. Cripps said only 10 percent of those who suffer from addiction are being treated for it. While opiates and heroin are the drugs people in the South Shore are most commonly addicted to, Cripps said she can counsel participants in any kind of addiction, including gambling or eating addictions. She will also meet those interested at a different time or location, if they are unable to come to the specified times or would feel more comfortable meeting elsewhere. Participants can walk in to the Hanson Public Library at the specified times to speak with Cripps one-on-one about any concern they have regarding addiction, whether they may be interested in referrals to medical facilities, information about how to respond to someone who is overdosing or even how to stage an intervention. Cripps emphasized that she available to discuss absolutely any aspect of addiction that someone wants to know about. Cripps said she is grateful for the space in the library that will allow community members to discretely come to get information about a topic that may make some uncomfortable. She added that she hopes more education and prevention in the community will reduce stigma and help those struggling. “It’s a disease, just like hypertension and diabetes,” she said, adding that chemical changes occur in the brain when addicts take drugs or alcohol that prevent them from making rational and healthy decisions. She added that two longer-term goals for On Solid Ground would be to open a small drug- and alcohol-free home for women in the area, and to develop a scholarship to help recovered addicts get their feet back on solid ground. While working full time, coming home to two children and taking classes at UMass Boston, Cripps began On Solid Ground a year ago December. Starting a nonprofit has always been her goal, she said, though On Solid Ground has developed more slowly than she would have hoped. She added that she has built up a network of dedicated professionals who are interested in being involved with projects as the nonprofit develops, but at the moment, she is working on her own. Her number one priority this summer is to assess Hanson’s need for resources and begin educating and helping those who want more information. For more information, or to set up another time to see Lynda Cripps, call 774-259-8102 or email osg.foundation@comcast.net. HANSON — Redevelopment of the 1057 Main St. site where a former Ocean Spray building was demolished in June 2011 has been stalled ever since due to environmental concerns at the site. Property owner Joseph Marangiello of Pembroke has now developed a pared-down plan for building on the footprint of the razed buildings, but has had difficulty negotiating the permitting process. He met with the Conservation Commission Tuesday, July 14 to determine the next step — filing a revised or new notice of intent for the project, as the present one dealt only with demolition. Marangiello has spent more than $1 million on the site since he bought it, including the demolition work. He said that he had, in fact, “given up” on the property for three and a half years, but changed his mind when someone offered to buy the property. “If he can do it, I can do, too,” Marangiello said. Selectman James McGahan, who has been working with Marangiello, and former Conservation Commission member Mark Vess have indicated their willingness to assist in the new notice of intent process. Several town officials have pointed to the site along the busy Route 27 corridor as a priority for economic development. Marangiello has three businesses he wants to build for on the site. Marangiello, a woodworker originally from Italy, has also been dealing with a language barrier and unfamiliarity with the zoning process. He pledged to obtain a copy of the NOI on Wednesday, July 15 and to obtain the assistance he needs. The new project Marangiello is proposing will be a 23,000-square-foot building on the foundation left from the 2011 demolition — down from the 60,000 square-foot plan he proposed in the past. The larger building would have encroached on nearby wetlands. Conservation Chairman John Kemmett asked if Marangiello had complied with all the orders of condition on the original notice of intent covering the demolition work. Marangiello said he was uncertain about that. The original notice of intent has been extended and is good through 2018. Kemmett said the property has been an issue — under different owners — for the entire eight years he has served on the Conservation Commission. Vess indicated there had been issues at the site going back about 35 years. Schellenger also raised the issue of past environmental problems at the site. Marangiello had admitted in 2011 that there were problems with the first company he hired for demolition. He then brought in Envirotest Inc., of Boston, to draw up a removal plan accepted by MassDEP, and Environment Resources Services in Middleboro to do the abatement and removal work when asbestos was detected at the site. Asbestos was initially confined to a 90-foot pipe, but became mixed into other debris as friable particles during the first phase of demolition. Water flow into the foundation has also been a problem. WHITMAN — The most popular sport you’ve probably never heard of has come to Whitman — pickleball — and it now has a home court at the old Memorial Field basketball court. The Whitman courts opened for the sport, which has been played in the United States and Canada for 50 years, on Tuesday, June 30. About 18 people had expressed interest in the program, said co-organizer Pat Goldmann. She and Betty Geary have been visiting other senior centers in the area to talk about the game they love in hopes of increasing that number. As she spoke, one doubles game was winding down and another quickly started. Since one net was not yet available, Goldmann used the second court to instruct neophytes in the rules of the game. Play will continue from 9 to 11 a.m., Tuesdays and Thursdays until late fall weather forces them indoors, but those who have access to a net may play anytime. According to the U.S.A. Pickleball Association’s website usapa.org, pickleball is paddle sport created for all ages and skill levels combining elements of tennis, badminton and ping-pong. The rules are simple and the game is easy for beginners to learn, but can develop into a quick, fast-paced, competitive game for experienced players, the USAPA states. Senior citizens across the country have really taken to it, though it has multiple-generation appeal. Selectmen on May 12 approved a request by Council on Aging Director Barbara Garvey to set off an unused basketball court behind the Police Station on Essex Street for the unusual low-impact sport named for a cocker spaniel who liked to chase tennis balls. He found a three-minute report from the erstwhile CBS Early Show, which he screened for the board to explain the sport. Local seniors who had been playing in Abington expressed interest in a location on which to play in Whitman, according to Lynam, who said the basketball courts in question would require some rehabilitation. He said some seniors are willing to help with the work and suggested the DPW might help fill in overgrown areas and level it out. The DPW also painted the pickleball court lines. Nets for the sport are portable and easy to set up. The number of people filtering in to play, or to learn how, on June 30 may have answered any questions on the matter. Geary and Goldmann’s visits to area senior centers to talk up the sport didn’t hurt, either. “Folks around here have played and practiced, now we have people from other towns coming,” said Garvey. As an indication of the game’s popularity with seniors across the country, Garvey noted that The Villages retirement community has 180 pickleball courts on its grounds. The USAPA site provides a full rundown on the rules, including how to make a serve, service sequence and scoring as well as the double-bounce rule, non-volley zone, line calls and faults. Pickleball fans are also reaping the benefits of physical activity, especially senior players. “Regular exercise and recreation are very important for older adults and the good new is it doesn’t have to be for hours at a time,” said Chris McLaren of Old Colony Elder Services. The Centers for Disease Control and Prevention points out that the loss of strength and stamina attributed to aging is in part caused by reduced physical activity. But CDC figures indicate that by age 75, about one in three men and one in two women engage in no physical activity. One solution, according to the CDC is the establishment of community-based physical activity programs that offer aerobic, strengthening, and flexibility components specifically designed for older adults. HANSON — When you get a blizzard on the day you planned to move into your new business address you can panic or take a page from Kristine Thayer’s philosophy: just reclaim it and create something beautiful. The owner of Attic Fanatic opened the doors to her new space at 1000 Main St., Hanson in early March and plans a grand opening open studio event for her furniture restyling business from 5 to 9 p.m., Friday, July 17. She also sells the line of paints that she uses. A major focus of the event will be the debut of a new display gallery that brings the beach to Hanson. The open studio will feature a preview of Thayer’s new painted furniture collection, snacks, spirits and an auction of a painted furniture piece to benefit the Hanson Food Pantry. The paint contains no volatile chemicals and is non-toxic. 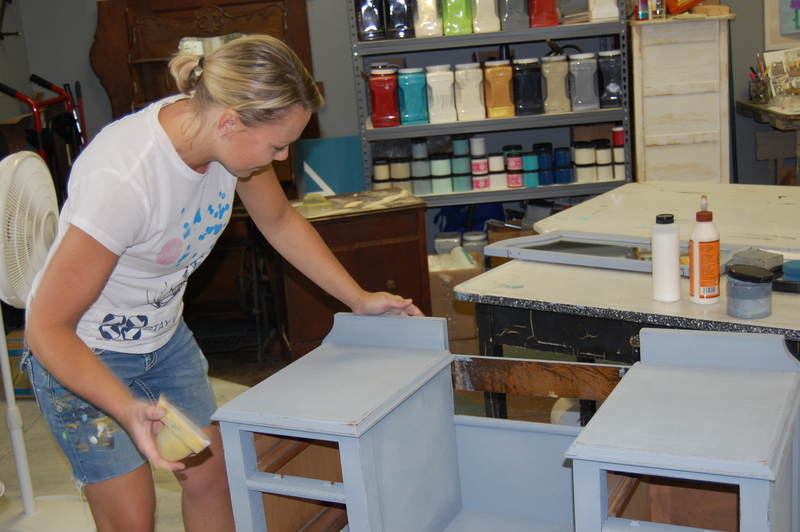 She uses the American-made brand for all her furniture repurposing and refinishing. Thayer is also taking part in a documentary being produced by her friend, Alex Eaves, on people who repurpose across the country. That film is due out this summer. There are the occasional hopeless cases, Thayer admits, but said more often than not she’s brought beautiful pieces that can be saved with some basic repair and a new finish. This isn’t “Antiques Roadshow,” where the message is that refinishing diminishes value. The walls of her studio workroom were lined on this day with finished projects as she and friend Kevin Oberbeck worked at various stages of the refinishing process on a dining table and a bedroom set for her new collection. A ladder rack adorned with colorful, fat throw pillows brightened a corner. She had previously operated the business on a retail basis out of a store on Broadway in Hanover for about a year and a half. The Hanson resident moved the studio out of a need for a larger space and her love for the town in which she lives. The business began in her garage. But antique furnishings may have been the last thing she intended to pursue, as she grew up surrounded by them. Her father started his numismatics business about 30 years ago and also dealt in antiques. Instead, Thayer worked in the corporate world for about 10 years with antiques becoming her hobby as well as a stress-reliever. It was while working in the marketing department at the Patriot-Ledger that she met Oberbeck about 15 years ago, a designer who created logo for Attic Fanatic. It had been her first job out of college. “I just help,” Oberbeck said. For more information on Attic Fanatic or the open studio hours, visit theatticfanatic.com. WHITMAN — Whitman Carousel Family Fun Center held an open house with family and friends of local skaters on Monday night to help defray costs for more than a dozen local skaters who are competing in the 2015 USA Roller Sports Figure Skating Nationals in Albuquerque N.M. from July 19 to Aug. 1. The night hosted performers of all ages who are traveling to New Mexico as well as beginners and intermediates who are not traveling but performed their first routines — such as brother and sister Christopher, 6, and Laura Miller, 5, of Brockton. The pair skated with light-up skate boots, which glowed neon, and their performances earned enthusiastic applause. Skating is a family affair for the Urzua children of Whitman. Five of the six siblings skate and have accomplished great skill all learning from their mother in the very skates she wore as a child in their toddler years. Now mother Betty Urzua works at the Carousel center as does eldest brother John, 21, a manager at the complex. The family, who are from Spain, are fourth-generation skaters dating back to their great-grandparents, who owned a skating rink in Michigan. “Daniel, Ethan and I all learned on our mother’s skates. Our grandfather told us he could skate before he could walk,” said John. “I am most comfortable in skates. It’s freedom and I felt like I am flying,” he said. The younger brothers Joshua, 11, and Isaiah, 13, have excelled in their skating. Even though they only began official lessons since September at the skate center, it is quite clearly in their blood. Both boys placed in regionals last month in Fairhaven, Mass. Each said they enjoy practicing and they like seeing their own improvements along with the abundant exercise. Joshua performed for the crowd on Monday, with his young sister Elsy, 7, who sparkled in a baby blue uni-tard as she twirled on wheels. Most of the skate club choreography is ballroom method although there are numerous different styles of skating throughout the sport. John and Deedee Viola are coaches at the Whitman center along with daughter Jodee and her husband Scott Cohen the pairs are set to travel with their teams. The techniques they teach use quad skates, the traditional four wheel booted skate. Over the years Scott Cohen said he has seen changes in popularity to the inline skate boot, which some teens use during skate times. “What is old is new again as now the quad skates are making a comeback,” he said. David Renna has been skating since age eight and after college in his early 20s he hung up his skates. “I took a hiatus for 30 years,” he said. But upon his return and in the best shape of his life the fifty-something skater is heading to New Mexico in late July. Renna who is from Malden travels to practice and skates 16 or more hours a week. He estimates his commitment to physical health and his upcoming competition are some of the best choices he has made. He joked that skating changes as you get older, falling seems a lot harder on the body, so there is less jumping and elegant ballroom choreography — he leaves the splits and daring tricks to the younger ones. He will compete in esquire team dance and master solo this month.